D2W are faster & easier to Install because they,re screwed to the ledger. D2W have a larger bearing surface for better load distribution. Testing showed that D2W do not weaken the connection llke washers. D2W are much easier to waterproof than washers. D2W can be used with a wider selection of fasteners. 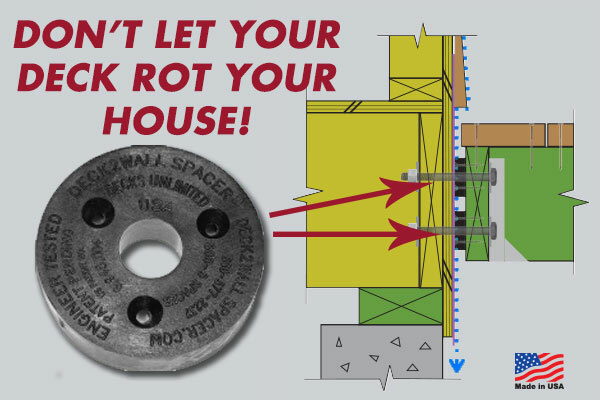 DECK2WALL® SPACERS WERE DESIGNED FOR THIS APPLICATION. WASHERS WERE DESIGNED TO BE, UMM, LET'S THINK ABOUT THIS .......... , WASHERS.